Anyone ever put a round counter on there Loadmaster ? You might look at ebay or www.sciplus.com . My pedometer didn't work out as well as I had hoped. It reset or something so I went back to plan A, making a mark for every hundred I load. It's easy to keep track because I know how many bullets I've bought so far this year (2000). Nice catch, bfox !!!!!! Ten bucks and free shipping. I ordered one. Thanks SteveW for the original link. I ordered it too. Thanks for making this simple. Great idea, price and the photos... well who need to burn brain cells with a place like this! I bought two and they are new . The only thing I had to do was take the screw out and put it so the arm would ratchet the other way . So far they work Great . bfox wrote: I bought two and they are new . It's interesting that their site found via a google search and one of the above links shows the price of $64, and the same place via your link has it at $10. maybe take a look at the honey do list.. 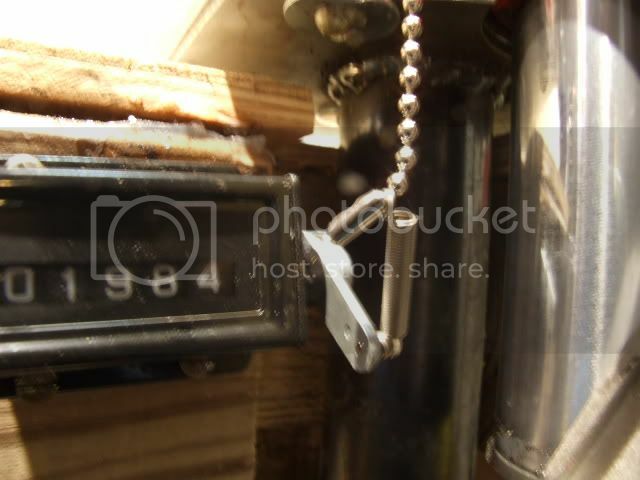 Exactly how did you hook the chain up on your counter? Is it anchored on the front of the bench? I got my counter today, it's suweeeet. darwin wrote: bfox,Exactly how did you hook the chain up on your counter? Is it anchored on the front of the bench? I got my counter today, it's suweeeet. They said mine was shipped yesterday..... can't wait. I think I got the set up from the pic you posted. But Mr. bfox be kind to Darwin and answer his question just in case what I think is not what is susposed to be. Thanks Darwin for asking.... keeps me from doing it wrong. Yes the counter is screwed into the bench . I broke the original chain . Bought some ceiling fan chain and it was long and I never cut it down . When I got the counter the extra length made it perfect . They do work good you Guys will like them . I meant is the CHAIN anchored to the bench. It looks like it might be in one of the photos. I got it. I raised the bell shaped thing on the end of the chain up a bit to allow me to add a link at the bottom of the chain. 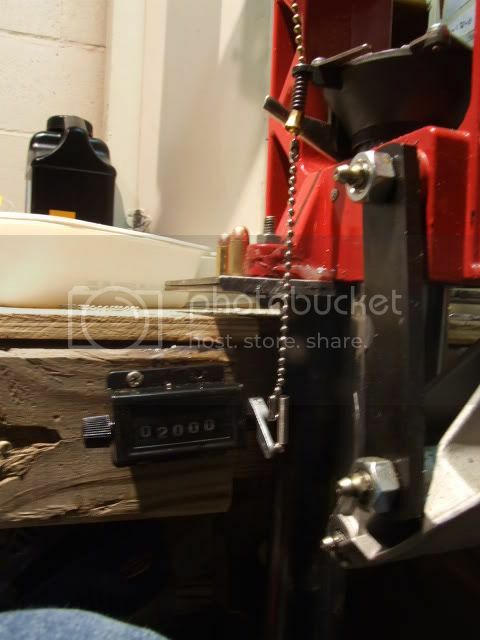 I mounted the counter so that the lever was directly below the chain. 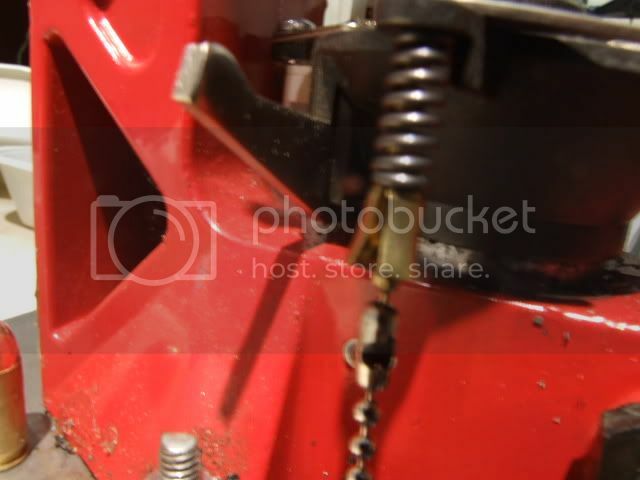 I used another link at the lever's spring to keep the bottom of the chain in place.. It works perfectly, only counting rounds that get a powder charge. Thanks again bfox and everybody. Great pictures. I got the fan chain already hooked up waiting. Need to find a spring so when it arrives I'll be ready. Would a ball point pen spring work? The counter has a spring on the end of it's lever.